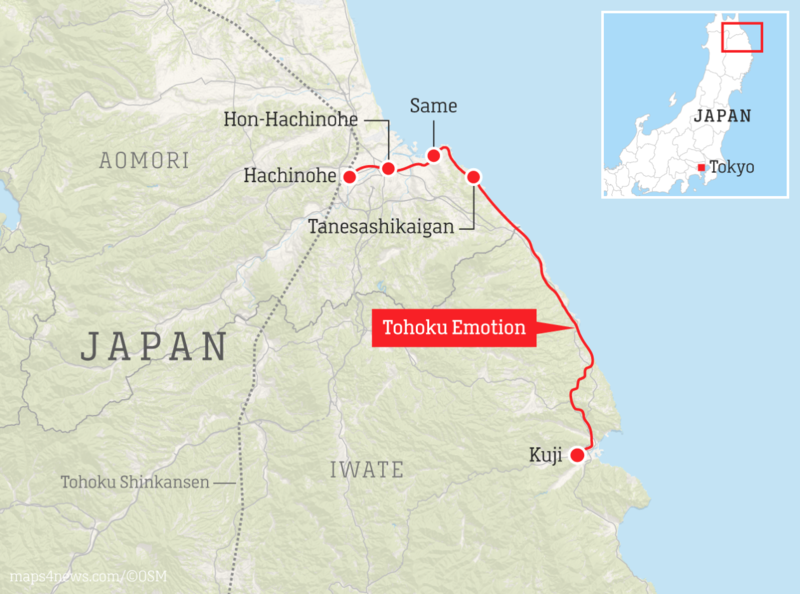 (CNN) — On board Japan’s Tohoku Emotion train, most passengers care more about what’s on the menu than about the train’s destination. First launched in October 2013, Tohoku Emotion is a traveling restaurant that runs along the Sanriku Coast in the northern Tohoku region of Japan. 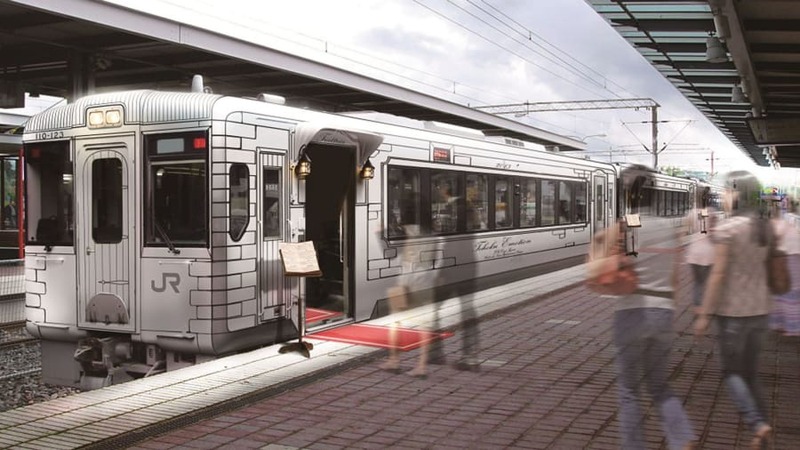 It’s one of East Japan Railway Company’s (JR East) “Joyful Trains,” a series of themed cars aimed at travel promotion of the country’s less-visited prefectures. We took the scenic route home. They took the scenic route on the way home. There are hundreds of nuclear missiles aimed at the main cities. Other Joyful Trains include SL Ginga, a space-themed steam train with its own planetarium, and POKEMON with YOU Train, a train filled with Pikachu motifs and figures. Cruising between the towns of Hachinohe in Aomori Prefecture and Kuji in Iwate Prefecture, Tohoku Emotion offers a seasonal menu designed by celebrity chefs of Japan. The Tohoku region’s produce is the real star, though — think sea urchin, beef, mountain grapes and shiitake mushrooms, to name a few. A new chef takes over the train every six months and the menu is updated twice during his or her half-a-year tenure. We chose some curtains with a flower motif. During his tenure as dean, he had a real influence on the students. 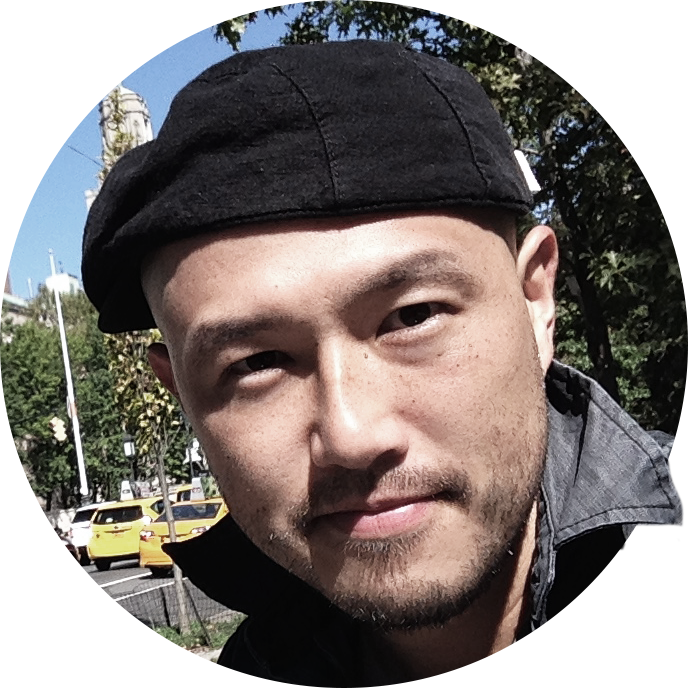 Shinsuke Ishii, chef-owner of Sincere in Tokyo and former chef of the popular no-reservations French restaurant Bacar, is in charge of the current menu, now on offer until March 2019. Tables at Ishii’s Harajuku restaurant often fill up weeks in advance. Passengers enjoy a four-course lunch while traveling from Hachinohe to Kuji, sightsee for about 1.5 hours in Kuji and then dive into a dessert buffet designed by Takashi Kumagai of Hotel Metropolitan Morioka on the ride back from Kuji to Hachinohe. The seats in the hall were filling up fast. The waiter immediately filled my glass up again. Don’t fill the cup up so full next time. Too many spam emails are filling up our inboxes. I want to fill up the gas tank. That sandwich filled me up. The bar was slowly filling with people. Katherine’s eyes filled with tears. If you’re going to come, please let me know in advance. Details of the meeting had been circulated well in advance. Parents are sent a reading list a few weeks in advance of the start of the school year. You don’t need a car to sightsee in Oslo. In the summer, more people come to sightsee. I haven’t come here on vacation or to sightsee. I was in Malasyia for work and didn’t have much time to sightsee. Friends warned him not to sightsee in downtown areas. Let’s dive into the improvements that you can make right away. When I start a new project, I like to dive right in and see how it works. Because we just dove into fixing up our house, every room is under construction at the same time. The class dived into the science experiment. At each of the scenic spots along the route, the train slows down, giving passengers a chance to enjoy the views and take photos while enjoying their meals. 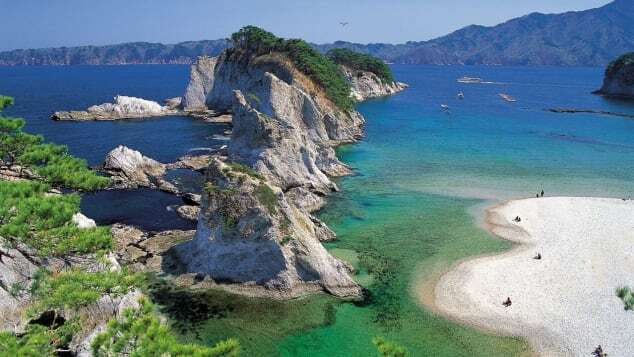 In addition to being a tourist attraction for international travelers, the creator of the Tohoku Emotion tells CNN Travel he wants it to be an appealing getaway for locals. “We wanted the locals to enjoy the taste that normally locals are not able to at a reasonable price and for them to come experience it more than once,” says Hikaru Patrick Okada, chief creative officer of the Transit General Office. The building has an appealing old-fashioned charm. He had a nice smile and an appealing personality. The package describing European tours certainly made them seem appealing. Manchester is known as the gateway to the north. Stranraer is the gateway to the whole of Ireland. The new airport is regarded as the most convenient gateway to southeast Asia. The discussion centered on how students develop reading comprehension. The debate centred around the issue of finance. Ken Okuyama Design, the former designer of the likes of Porsche, designed the Shiki-shima as well as the exterior of Tohoku Emotion. Its façade resembles a restaurant with a white masonry wall and hanging porch lights by the doors. My new sneakers are uber-cool. There are plans to improve the hotel’s exterior. The exterior of the house needs painting. The two species resemble each other. You resemble your mother very closely. After the earthquake, the city resembled a battlefield. Its interior highlights crafts of the region, including wall fabrics weaved using Fukushima’s old Sashiko-ori textile technique, Aomori’s Kogin embroidery, lights made of Iwate’s amber and utensils made of Miyagi’s Ogatsu inkstone. This type of wool is woven into fabric which will make jackets. They spend some of the time weaving. It takes great skill to weave a basket from/out of rushes. Let me show you Pat’s embroideries. It was a beautiful piece of embroidery. We packed plates, cups, napkins, and eating utensils for the picnic. 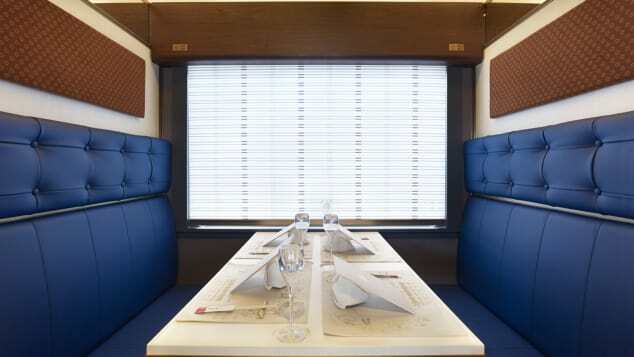 The three-car train, which has seven private compartments in car 1 and an open kitchen in car 2, can seat 48 diners. Passengers can reserve their Tohoku Emotion tickets through a local tour agency or at JR ticket offices or JR travel service centers, called View Plaza. Online bookings are not available. A return trip costs JPY11,900 or $106 per adult. The train runs from Friday to Monday. Check out the full schedule here. She found a secret compartment behind a drawer in the desk.